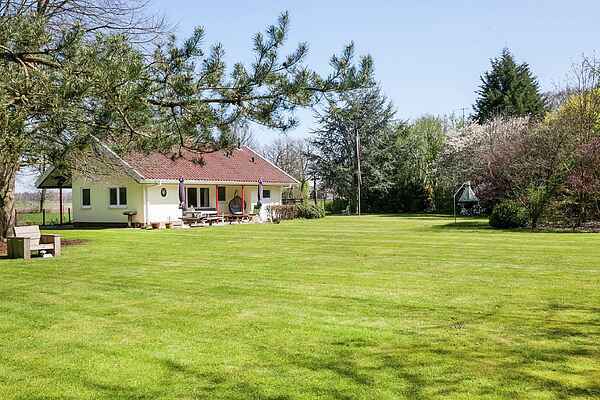 In the area of Heino, Overijssel province, you'll find this detached holiday home in the middle of nature. Do you love nature and being outside? Then this holiday home is perfect for you! The house is surrounded by a large, 3,500 m2 garden. The garden is completely enclosed with a sturdy, 135 cm high fence. Here you can enjoy your vacation and the magnificent view you have from here in complete privacy. For the children it's a true playing paradise with the trampoline, swings, sandbox, football goals and ping pong table. While the children are playing outside, you can enjoy the tranquillity and space around you on the covered terrace. The house is fully equipped for a delightful vacation. The area offers various hiking and cycling routes through the magnificent hilly landscape of Salland. The museum and castle Kasteel het Nijenhuis in Heino is certainly worth a visit. A lovely day out? No problem, consider picturesque Dalfsen or the cities of Zwolle, Deventer or Almelo. A little further you can find Apeldoorn, where Paleis het Loo and Apenheul are of course also highly recommended.